Today, more and more digital signage networks are emerging from unconventional settings. Going beyond the traditional realm of advertising and content delivery, digital media assets have become an integral part of unique customer experiences. From the driving range to the gym, a variety of new networks have been able to integrate programmatic monetization. Keep reading to find out how these businesses navigated through the transition phase and learn best practices on evaluating the right opportunities for your digital signage operations. 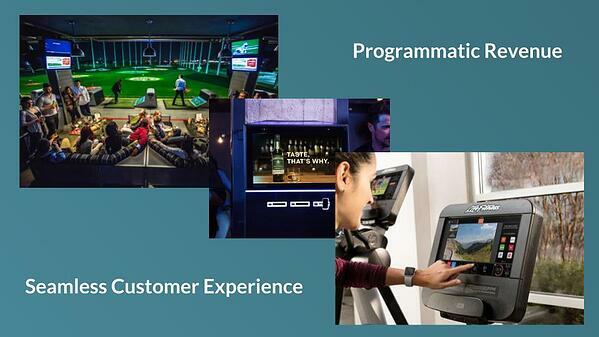 Last summer, Topgolf launched their partnership with Vistar Media, bringing Vistar’s ad serving and Cortex player management software to the Topgolf network of +5,000 screens. By integrating Vistar’s full-stack solution, they have been able to improve both the monetary performance and infrastructure stability of their network. With this integration, Vistar provides Topgolf with support for multiple hardware platforms and operating systems - including ChromeOS and LG WebOS - and scalable support for delivering billions of ad placements per year. Moreover, Topgolf inventory can be found on Vistar’s ad exchange for digital out-of-home media. By opening up their network to media buyers can place their buys programmatically through private marketplace deals or through Vistar’s ad exchange. Before Vistar, Topgolf struggled to find a solution tailored to their network’s needs. Erin Huard, Director of Partnership Products and Operations, shared that a previous partner’s software resulted in interrupted service to Topgolf’s screens. Since their old ad server was receiving so many requests from the same IP address, it was flagged as a DDOS (distributed denial-of-service) attack, disrupting programmatic transactions. Fortunately, Vistar’s ad platform has been built for DOOH and provides a seamless programmatic solution. Original equipment manufacturer (OEM) Life Fitness was looking for a solution to help sell their inventory and serve ads on their screens. This unique network encompasses the screens found on Life Fitness exercise machines, such as treadmills, ellipticals and stationary bikes. Life Fitness’ media division is a small team, so they needed a solution that would help operations run smoothly and efficiently. Vistar was able to meet their technical requirements and provide them with a foundation on which to grow their burgeoning ad business. To date, revenue from the Vistar Exchange has demonstrated strong evidence that Life Fitness is going down the right path. At networks such as TouchTunes, BevTV and Buzztime, simplicity is key. With small in-house sales teams, these screen operators want to be able to optimize the ad revenue generated through an automated solution. Through the Vistar SSP, these operators are able to improve the overall monetization of their screens. However, while programmatic can provide a strong foundation on which to grow and serve as a launch pad for realizing greater revenue from digital buying teams, it is only one piece of the media puzzle. Even with Vistar’s revenue boost, many networks also rely on direct sales teams. Thankfully, Vistar’s platform also provides networks with all the necessary tools and capabilities to grow a business that successfully combines programmatic revenue with direct sales strategies. Ready to find out how you can better monetize your inventory?